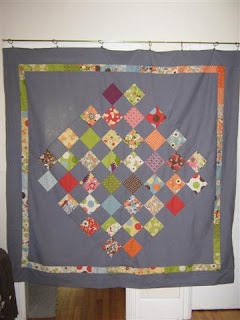 Here's the last update on my mom's tranquility quilt, because it's COMPLETE, hah! 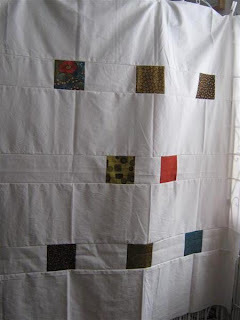 I struggled with the question of how to quilt this quilt since my mother doesn't have any special foot attachments for her machine and they were either not available or insanely expensive. I had some great tips from you, my readers and it turns out that stippling doesn't really require a quilting foot, hooray! 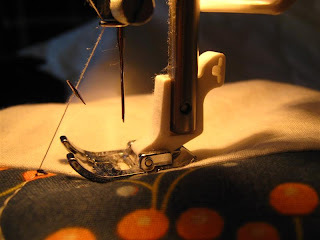 It worked pretty well - the only issue is of course that the regular foot doesn't have a spring to move it down when the needle moves down - thus, as I pull the fabric around, the needle is repeatedly bent. I'm always so greateful that the needle tip is attached to fabric and can't jump up into my face at full speed! 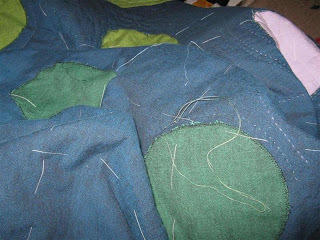 The second needle made it through the rest of the quilt, and I tried to go a bit more slowly, as well. The second question was thread colour. I hadn't considered in my colour advice for my mother, that a dark blue side combined with a white side makes thread choice tricky. a) using two matching threads has two problems: 1) dark thread is heavier because of the dye in it, therefore tension problems are common. 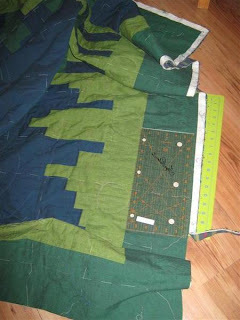 And 2) with the problems we had with tension during piecing, it was clear that both threads would be seen on both sides at some point along the quilting line. b) I had bought a ton of invisible thread - and I hope I can return it. It's horrible stuff! Well, I'll give it another chance on my machine at home, but the tension was off the board (I had loops of about 3 cm length on EVERY stitch on the underside. Also, the stuff feels aweful compared to nice cotton thread. Do you guys have experience using invisble thread? Do I have to do something different with it compare to cotton? Anyway, we ended up using white and blue thread and in the next post, I'll show you the results! I just couldn't wait anymore to start finishing my Imagination 1 quilt. 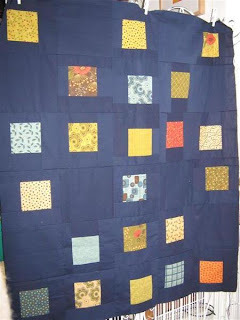 I'm not done with all the quilting yet, though I'm getting there, but I was just itching to put the binding on! 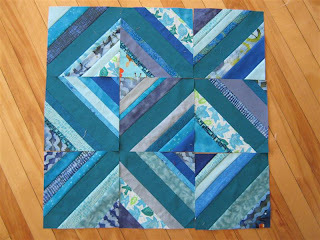 So the other night, I started cutting the edges away to square the quilt up. 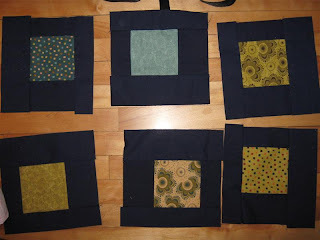 Oh, it was so exciting, a big step (as opposed to all the teeny-tiny handstitches!). 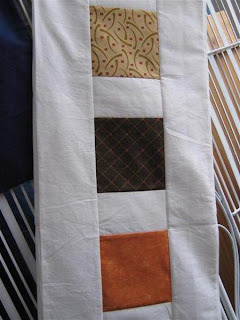 I hand-stitched the 3 sides I had binding for on anyway, and will add to the binding strip soon, to complete that step. It feels awesome to work with a finished edge, anyway! The concentric circles are working out really nicely by the way. I had blogged about the design here, and I'm pretty much sticking with it. You'll see some pictures soon! Do any of you get weird comments with asian characters and obscene words in between? I mean, someone must be taking the time to go to my blog, type the comment and also fill in the security word etc. Pretty determined spammers! As I mentioned last Saturday, I had some charms from the MODA Tranquility line leftover. 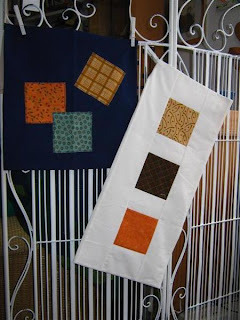 Well, it happens to be around the time of my mother's birthday, so why not make her some matching pillows for her reversible quilt!?! 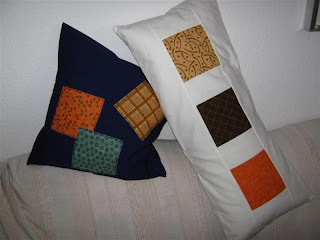 I briefly thought about a reversible pillow, but I think having two works better. Plus, she has this really wonky loooong pillow on her couch and I thought it'd be fun to make a case for that. 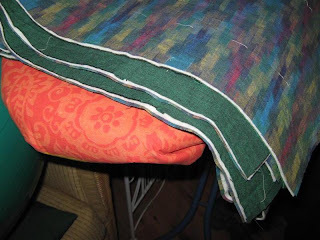 And really, I find sleeve-pillows like the ones I wrote a tutorial for much easier to make than ones with buttons or zippers, so the back wouldn't really be for presentation anyway. From this distance, they turned out great, no? I had a bit of trouble with the white pillow - I find it difficult to get the right measurements of pillows - they never quite behave the same along their entire length, they're less puffy at the ends, so my pillowcase tends to be too big at the ends and/or too tight around the middle. 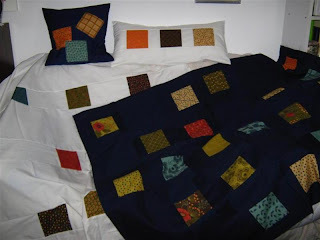 Enough talk, here are the pillows with the quilt tops (two tops, really - no back). 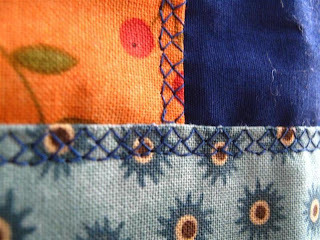 I also had fun using a stitch OTHER than straight or zig-zag - which is all my own machine manages (but the quilting attachments are cheap, yay!). So here's the finishing stitch I used to applique the charm squares onto the navy pillow (the white one is obviously pieced). 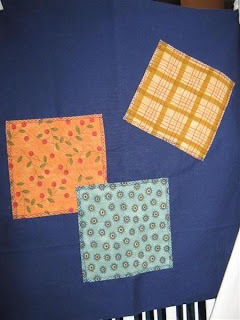 I folded the edges under, rather than raw-edge applique as I'm a bit tired of that look. That stitch sure uses a lot of thread! 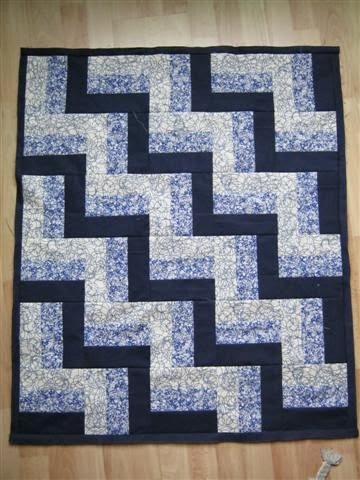 However, I think I might actually try quilting with a zig-zag stitch on a quilt soon - with a contrasting thread, that might be a really neat effect. We shall see! I helped my mother get started on it while she was visiting with me in September. Now she's finished the top (navy) and the back (white), though front and back are really arbitrary names here, it's really a two-way quilt. She's getting excited about sandwiching it! 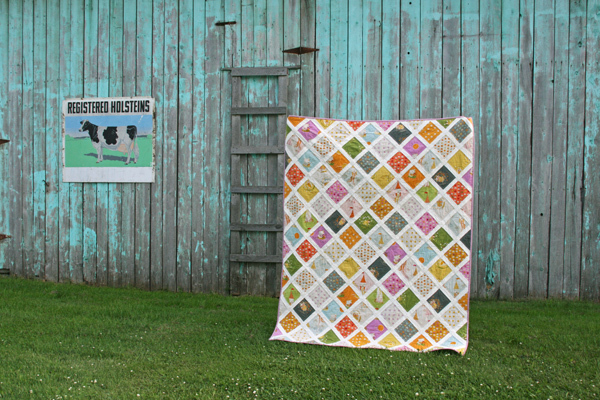 I'm personally dreading the quilting a bit, as she doesn't have any special attachments for her machine (walking foot/darning foot) and I checked into ordering them, but the parts are either unavailable or horrendously expensive (it'd be cheaper to send the quilt out to get quilted!). It's an old old Husqvarna model, hence the trouble. Here's a bit of a pre-view - with admittedly not very much to see - of the echo-quilting on my Imagination 1 quilt. 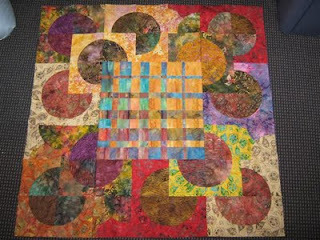 I have hand-quilting threads of all the colours in the quilt and am echoing with random colour choices around the circles. I've also started to echo around the bars on the edge because I'm itching to take the basting stitches out - I get caught in them a lot. I borrowed a large frame from my quilting teacher Helen, but now I took the quilt with me on a visit, no space for the frame, so I'm lap-quilting it anyway (the way I've hand-quilted the MODA baby quilt I started last May, as well). 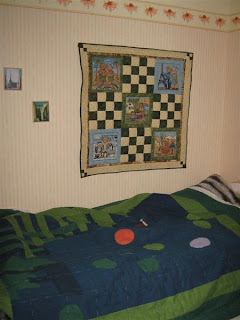 Here's the quilt spread out at my grandma's, and look what's hanging in a place of honour on the wall!! The teddy bear quilt I made her Christmas 2008 - yay, that makes me happy! You can all be the judges of how successful I'll be. Maybe the most important step would be to cancel my subscription to the Fabricville (in other provinces Fabricland) flyers which always have these tempting sales in them!